Since we recently posted about the big ditch fiasco at Deák tér, we shouldn't pass up the opportunity to consider some of the other large holes that are popping up all over this fair city, making it distinctly less fair. Construction is going on all over Budapest, in some cases quick and efficiently, in most cases slowly and dragged out over a period of years during which some of our most beloved public squares resemble parts of the Isthmus of Panama in 1901. Take for example Blaha Lujza tér, one of the most central intersections in downtown Pest. The old "Press Building" was torn down last year to make way for the construction of... something. We don't really know yet. Usually this means another glass "office complex" monstrosity with a Burger King on the ground floor. The "Press House" used to house various old commie newspaper offices back in the day. 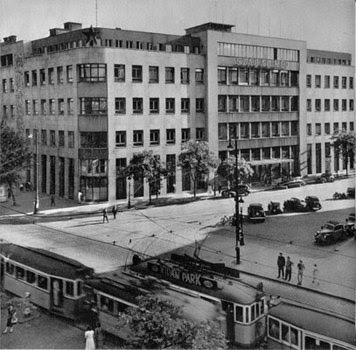 After 1990 it was handed over to a series of rabidly right-wing and anti-semitic newspapers (Istvan Csurka's "Magyar Forum" among them) as headquarters. These rags went bankrupt and eventually there were no sympathetic post-commie commie governments to keep paying their rent, and so the building went under the block. In any case, I passed their monumental dig today. Blaha Lujza tér is a sad story of how a vibrant urban center becomes a run-down bus stop with a couple of fast food joints. It is the Retail Location of No Return, an elephant's graveyard for a long string of resturants, the Bermuda triangle for clubs and theaters. Yet, it had a lot of class. At least one ornate front wall is being kept as a reminder of its better days. Meanwhile, five minutes down the korut is the Big Dig at Rákóczi tér, destined to be a new Metro station for the imagined fourth metro line. Rákóczi tér used to have the reputation of being the streetwalker's district, and while you can still see some rather toothless professionals plying their old trade in the area, for the most part everybody is looking forward to the new metro and the possiblity of developemnt that it should bring. The whole history of the Four Metro is aready a tale of huge cost overruns and money disappearing down into a huge hole, but most Budapest residents still hope that someday they - or their grandchildren - will get to ride on it. Until then... big holes in the ground. At least this hole is an intentional, voluntary attempt to rebuild the city. 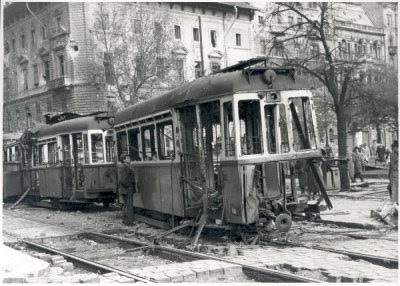 Budapest has been bombed into dust more times than anyone cares to recall, such as during the Hungarian Revolution in 1956, when Rákóczi tér looked like this. We can at least be satisfied that whatever happens, it will be for the better... someday. Over in Buda, another Big Dig is happening at the corner of the old Skala Metro site in the eleventh district, which is completely hamstringing mass transit and commuters trying to get to anyplace in south Buda... such as the Fono Music house. It takes about ten minutes to simply walk around this hole to get to various substitute buses going anyplace. Have Moicy! 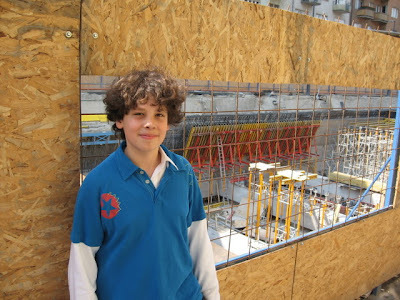 One cool thing about giant holes inthe urban landscape... kids like 'em. Aron sure does.... In any case, we are taking off tommrow for a week in Milan, Italy. I'm not sure when I will be posting, if at all, from Milan, but expect that we will all be enjoying "apertivi Milanese" for five days. Basically, the Milanese have reinvented "happy hour" as a mad buffet where every bar and restaurant offers all you can eat buffets and snacks from 6 pm to 9 pm for the price of a drink. I've done this before. And now I am going to do it again - Fumie found an amazing deal on the web for Whizz Air offering tickets to Milan for Ft 40 each (about US 27 cents) , plus the rather pricier airport taxes. We'll stay at a good friend's , and whatever I didn't eat in New York (i.e., Italian food) I will murder in Milan.